Follow @immunetoboredom on Twitter or check back here for updates throughout the festival. Share this widely if you please. The Rova Saxophone Quartet played in Atlanta tonight, a little sneak preview of the coming sonic onslaught of Big Ears. Two sets, unamplified, in the beautifully resonant Existentialist Congregation Church in Candler Park. There was a decent little crowd in attendance that knew how to listen and unpocket their cash for CDs. Rova is appearing twice at Big Ears, once in the Knoxville Museum of Art (Friday at 2 p.m.) as a quartet. The sound in that building is perfect for Rova, which is celebrating its 40th year as an ensemble. Consider that, the level of commitment that entails. No knock on the fellas (who are really fine company over a good meal), but this is not music to get rich by. Yet they have hung together, recording around three dozen albums and collaborating along the way with a brigade of prominent musicians, dancers, and composers. Tonight’s show was primarily material from their latest album, In Transverse Time. 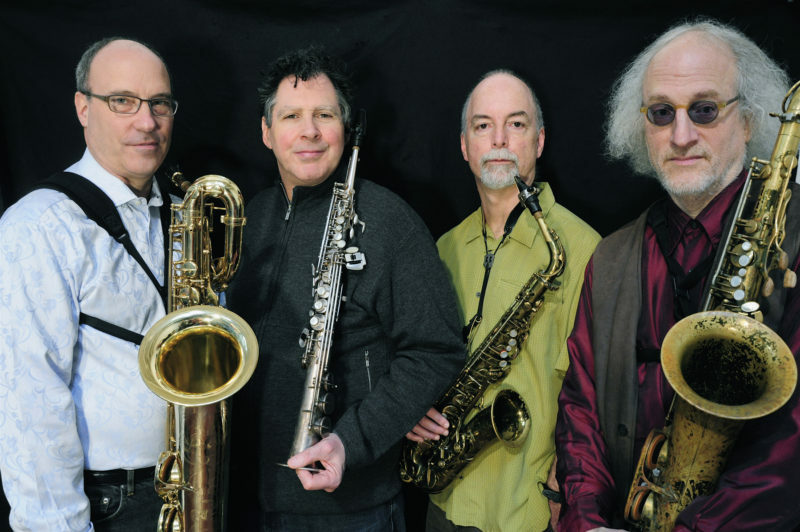 The high point of their two sets was the lengthy composition “Hidden in Ochre”, a composition by tenor saxist Larry Ochs. At 24 minutes, this is not an easy pull for most audiences. The moods shift, there are alternating segments of silken beauty and percussive splats. It is in some ways a prototypical Rova piece, a stealthy mix of composition and improvisation that – like the best of what was once called ‘avant garde’ or ‘new music’, and is now really just music – often leaves the listener wondering where the composition/improvisation border resides. No matter. The crowd fairly exploded at the quiet conclusion of this piece. Pre-show, the quartet played a few notes of Coltrane’s Ascension, a brief teaser for their Saturday midnight show at the Bijou. Rova Channeling Coltrane: Electric Ascension will feature the quartet alongside the likes of Nels Cline, Jenny Scheinman, Okkyung Lee, Cyro Baptista, Yuka Honda, Ches Smith, and Mazz Swift. It is one of the red star, must see events of the Big Ears banquet. Coltrane’s Ascension, recorded summer of 1965, is one of the most radically transformative works in the music some call jazz. It is also one of the most controversial: the seemingly unbridled energy belies a structural underpinning that listeners often miss. This structure forms the foundation of Rova’s recreation. This is not cover band mimicry, but rather an attempt to tap into the energetic stream that Coltrane was cultivating in his later period. This is music in pursuit of ecstatic immersion, a headlong dive into the possibilities of transcendence through souuuuund. It is also a logical extension of Trane’s pursuit of the transcendence – a headlong pursuit of what some call Godhead – that became apparent with A Love Supreme. But damn. Ascension was hard listening for anyone trying to squeeze it into a jazz frame, or into any kind of frame that isn’t Ascension itself. Since then, sonic explorations of this nature have become part of the accepted vocabulary, and at its worst, a set of cliches deployed by players who lack the depth and chops to make it really work. But even in the most capable hands, this is not easy listening by any stretch. Here comes that word again: commitment. Lucky for us, Rova and their assembled cadre have the inside-playing credibility to turn their outside excursions into something worth hearing. It’s worth the commitment. Some folks – like me – believe music can change the world. The fact that Rova has the impulse – much less the sheer audacity – to bring Ascension to life 50 years after the fact indicates that they believe it, too. This may be one reason why they have persevered for 40 years. Ears Embiggened: Seven Bassoons. No, Really. i2b is a labor of love. Show a little love by dropping a little coin on Your Narrator.